Exclusive look at character designs from upcoming Pixar/Disney films! 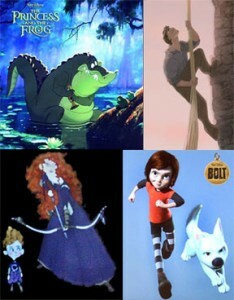 Rush over to the Character Design blog while you can for a rumored first look at early character designs from upcoming Pixar and Disney character: Miley Cyrus’ character Penny from this November’s Bolt; the soulful singing crocodile from the anticipated 2D feature The Princess and the Frog; the prince of Glen Keane’s Rapunzel; and several character from Pixar’s first fairy tale, Brenda Chapman’s The Bear and the Bow. The site also features great character designs from past Disney classics such as Robin Hood, 101 Dalmatians, The Little Mermaid, The Hunchback of Notre Dame and Pocahontas. Thanks to ‘rsly75’ from the Animated News & Views Forum for the heads up.